Maximum speed and efficiency with All Flash Storage Arrays. Cybernetics' iSAN® Series SAN storage arrays are flexible data storage solutions with models to facilitate small to enterprise level businesses that have growing disk storage and data protection needs. Designed to deliver unmatched performance, iSAN® storage arrays have flexible configuration options that let you tailor the system to your specific needs. Choose from 8 to 24 bay chassis and select any number, type, and capacity of disk drives you need. Unlike competitive models in this class, you can mix and match SATA, SAS and SSD disk drives to your specific requirements. The iSAN® Series is loaded with on-board data protection features like snapshots, remote deduplicated WAN replication, and portable disk or tape backup. Virtual disk snapshots can be performed on-demand anytime, on a schedule as often as every 5 minutes, or when data changes reach a threshold that you set. Data replication can coordinate with snapshots or be executed separately. Data Backups execute per virtual disk as a background task with minimal operational impact, and can be scheduled or run on-demand at any time. Offload copying starts immediately, so there is no "backup window." 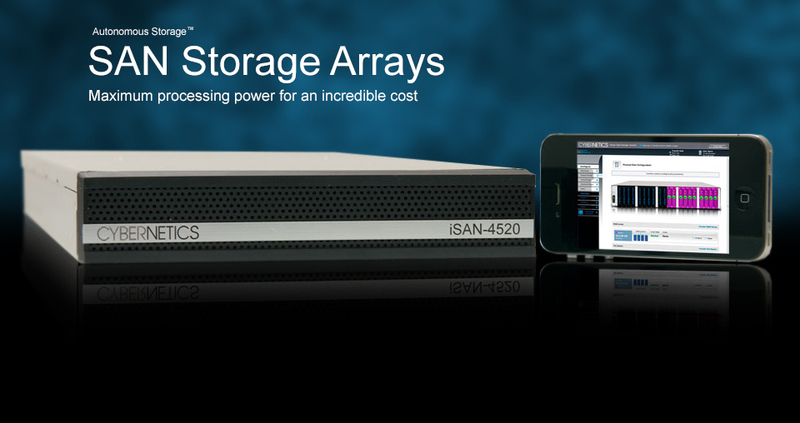 Cybernetics' iSAN® Series storage arrays are the ideal choice for businesses that want performance, multiple layers of data protection, hardware redundancy, flexible configurations, and future upgradeability.